After his blockbuster Public Enemy that was huge success, director Woo-Suk Kang got green lighted for another big project, Silmido. 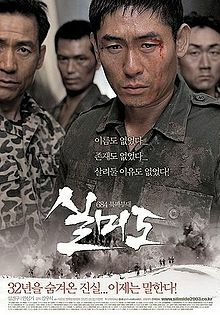 Yet another South Korean movie that draws it's plot from tensions between both neighbor Korea's, and sure enough it did well in box office. But common theme doesn't mean bad movie, definitely not in this case. In 1968. group of North Korean special forces consisting of 31 man, infiltrated South Korea with mission to assassinate president Park Chung-hee. They failed. However this event shook South Korean intelligence agency to it's core, and decision was made to answer North using similar means. On Silmido island a special force is being formed to accomplish this task. Under the name "Unit 684" 31 criminals, some from death row, have been recruited and begin their training to infiltrate North. In 1971, when unit is finally ready to commence their mission, there are changes in political climate in top layers of government, peace talks are priority, and decision is made to eliminate Unit 684. But before this order is carried out, there is revolt on island. Movie is based on true story, and you can read more about it here, which is quite interesting piece of history, as existence of this unit and it's mission was kept secret until beginning of 90's. After release, and huge popularity, South Korean government officials were vocal about how film depicts cruelty that government subjected it's soldiers. However it needs to be understood that this is a movie, and not documentary, and it's to be expect from director to make it more dramatic for the sake of entertainment. Either way, this is really good thriller, that's worth a watch.